Keeping your Pets Safe this Halloween! Halloween is fun for everyone, but did you know that you could be risking your pet’s health in the process? Listed below are a few things to avoid this Halloween. Watch out for those curious noses and paws. Dogs and Cats are very curious by nature. Keep them away from lit Jack – O-lanterns (especially if they are lit by candles), candy wrappers, and any party favors that could be a choking hazard (balloons and streamers, etc). Candy, especially chocolate, can make your furry friends very sick. It’s best to keep this toxic food away from your pet, remind your children to not give any candy to your pets, even if they beg for a treat. Throughout the night your door will be constantly opening and closing. There will also be strangers dressed in unusual costumes. This can be very scary for our four-legged friends. Some dogs can get territorial and may get anxious or even start to growl. If your furry friends are allowed to stay in a secure room away from the door, this will prevent them from bolting out the door and keep them stress free! Only dress your pets in a costume if you know they are okay with it. Check that the costume isn’t too tight in any areas, it doesn’t restrict movement, hearing, or the ability to breathe or bark and meow. Watch out for costumes with rubber bands, these can cut off circulation and/or burrow into your pets skin. Some pranksters have been known to tease, steal, and even harm pets on Halloween. This is a horrible thing that can happen, but it is preventable. 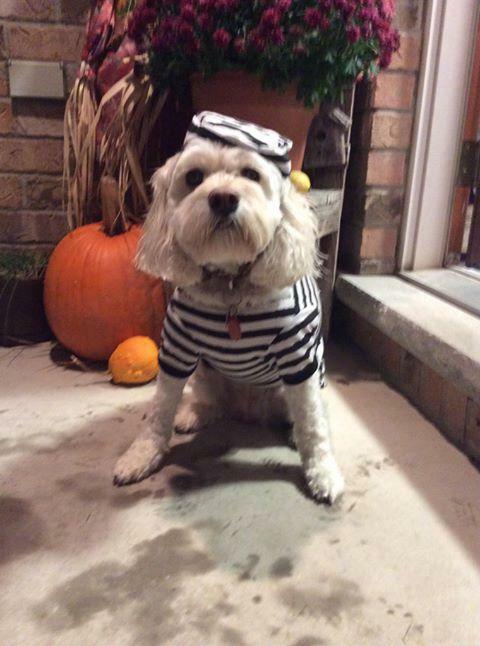 It is not always a good idea to take your dog with you when you go out to collect your candy. They can be easily scared by children passing by in costumes, and even frightened by loud noises. If you do take your pet with you, walk them on a short leash and have them wear a reflective collar or flashing light to make them more visible. Happy Halloween from all the staff at Coventry Animal Hospital.